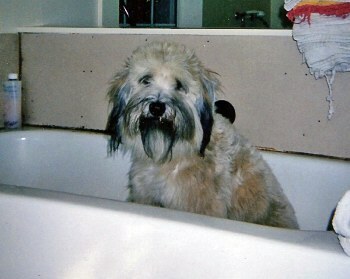 As a side service, I offer year-round, house to house, pet grooming services within the Adirondack Park. As the title suggests, I have the clippers, and will travel. 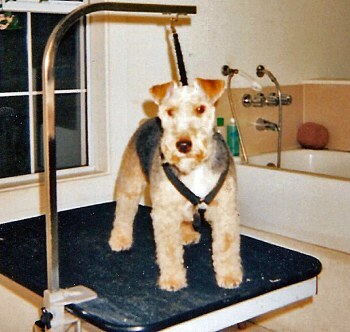 With 15 years experience grooming dogs, 8 years both mobile and in home; and 7 years working in my own salon, I have the patience to tackle most grooming situations. All breeds and all sizes are welcome. I have all the equipment I need to work with, tools, table and dryer. The only things that my clients need to provide is a place to set up and work, an electrical outlet, and a place to bath the dog. I charge a straight hourly fee for each animal, with no differences for breed or coat type, and an additional milage fee will apply for any distance beyond a 15 miles radius from the house (30 miles total travel). The client's total charge will depend upon how long it takes to finish the animal, and mileage fee if applicable. Current rates as of January 1, 2007 are $25.00 per hour to groom, and $.50 per mile for the mileage fee. 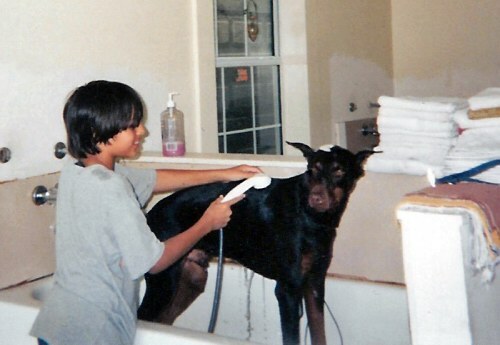 My big red doberman was the first dog to get a bath in our new grooming salon in Florida. 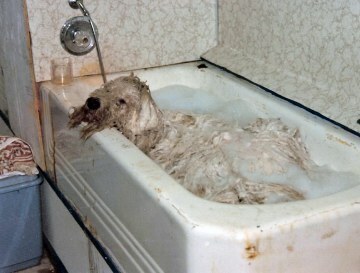 Like a lot of his kind, he tolerates a bath as something that must be endured, not a treat to be enjoyed. 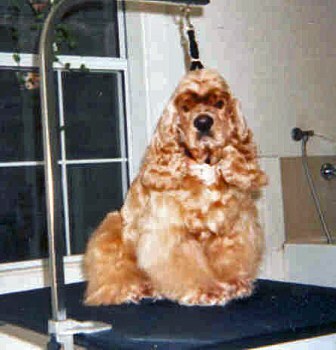 A Cocker Spaniel is considered to be "high maintence" and when their owners wish to keep them in a full coat it can take 2 hours or more to finish their grooming session. 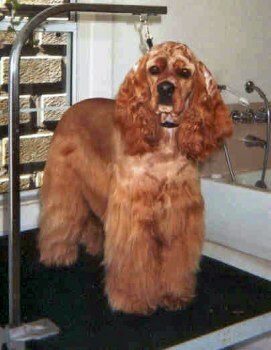 While most cocker owners prefer the long look, after months of dealing with all that hair, they usually give up and have their dogs cut short. Cindy Sue and Bailey are two of the most beautiful and sweetest Cockers I've groomed. 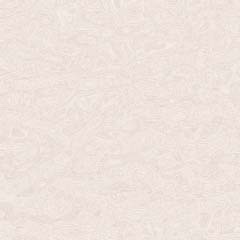 This happy little dog is Bonnie and she is a Coton de Tulear. Said to be the Royal Dog of Madagascar, Cotons' are rarely seen in the United States, but are shown throughout Europe. 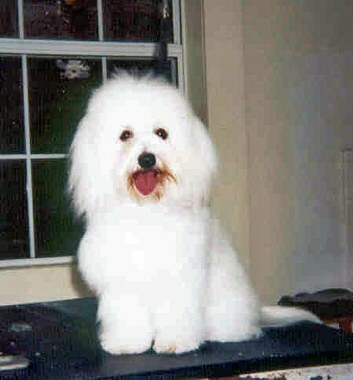 They are from the same family of dogs as the Maltese, Bichon Frise, Havanese and Bolognese. While different breeds of terriers vary somewhat in appearance and trim, for the most part, most of the "long-legged" ones are similar to each other, as are the"short-legged" ones similar to each of their cousins. 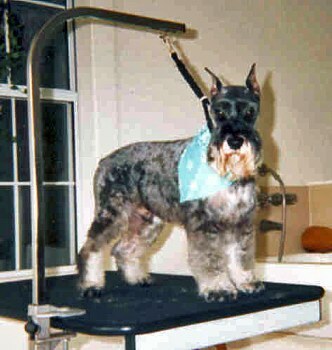 The right photo is a Lakeland Terrier, and the left photo is a Miniature Schnauzer. 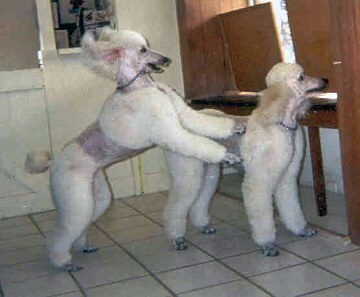 Poodles make up a large portion of the dogs groomed by professional groomers. 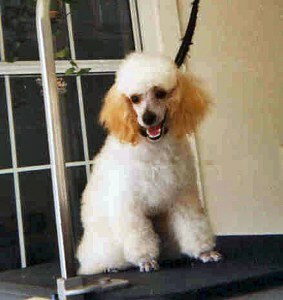 The Toy Poodle in the first photo is trimmed in a full "puppy clip". His face has been shaved, and his feet have been left full. 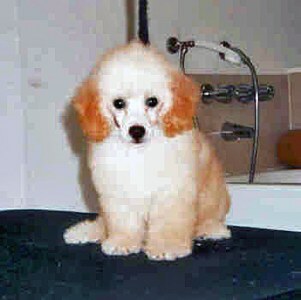 The Toy Poodle in the second photo is trimmed in a "lamb clip", with her face and feet shaved clean. 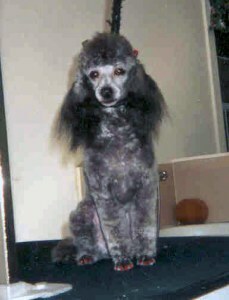 The grey Miniature Poodle above is shown in a "kennel clip". Her face and feet are shaved, and she's finished off with bright red nail polish and bows in her ears. Rounding out the poodles are Cane & Cleo, two of the biggest standards I've ever seen, measuring almost 25 inches at their shoulders. Litter-mates, these two are shown in a "town & country" clip. Each Standard Poodle can easily take 2 1/2 to 3 hours or more to groom, depending on the trim, coat condition and the dog's temperament. Boris is not actually one of my clients, he was groomed by a friend of mine, shown here in the second photo with him. He is included here only as an example. 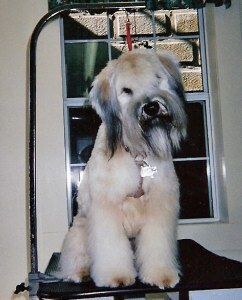 Komondors are one of a handful of breeds whose coats are "corded". 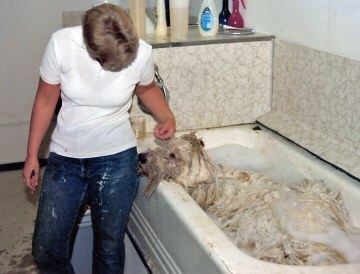 Grooming these dogs is not only time-consuming, and expensive, but sometimes messy as well. Clients with the space and resources for the in-home grooming of such an animal are welcome to call and we can discuss the details.